Owen Appleseed – Naming a blog is harder than naming a kid. Owen Appleseed, a photo by marymactavish on Flickr. 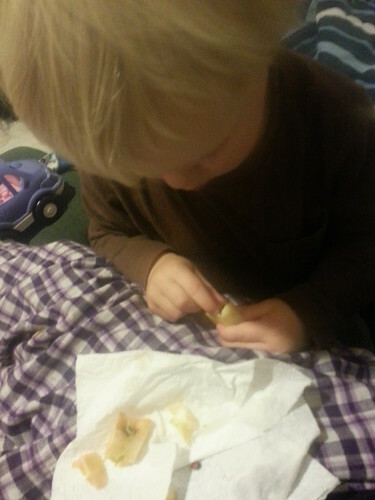 While I was eating an apple in Owen’s room today, he noticed the seeds. “Open?” he asked, wanting me to get them out for him, so I sort of loosened their little hideyholes and he dug for them. At his age, “These are the seeds, if we put them in the ground, maybe baby trees will start” was enough. Things like “most modern trees grow from grafts,” all that can wait until later. I’m really looking forward into having a yard where we can plant a garden for food, beauty, and maybe natural dye plants, and where he can watch seeds or scions become baby plants and thence food.